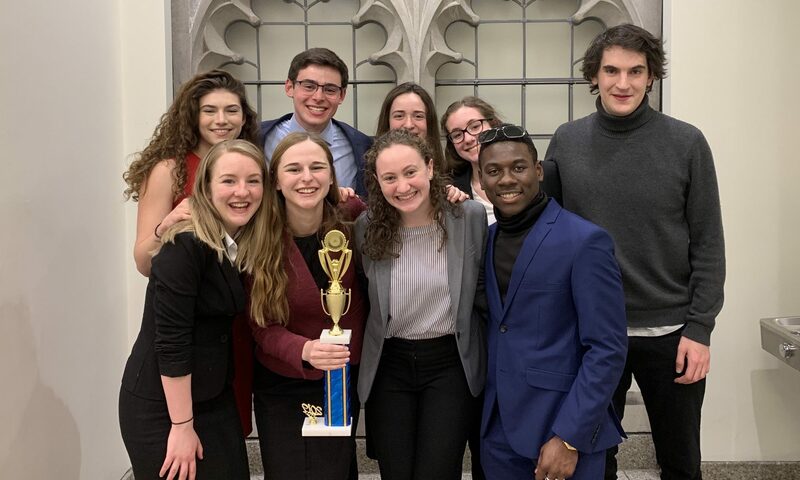 Wesleyan Mock Trial sent a split-stacked team (a combination of 1525 and 1526) to compete as Wesleyan A and team 1527 to compete as Wesleyan B this past weekend at the Bobcat Invitational, hosted by Quinnipiac University. Heather Pincus won an Outstanding Attorney award for her performance as a defense attorney. Wesleyan Mock Trial sent a combination of 1525 and 1526 to compete in the A division, and a combination of 1526 and 1527 to compete in the B division. In the A division, Zenzele Price won an Outstanding Attorney award for her performance as a prosecution attorney, and Heather Pincus won an Outstanding Attorney award for her performance as a defense attorney. In the B division, Tobias Wertime won an Outstanding Attorney award for his performance as a defense attorney. Full results here and here. Wesleyan Mock Trial competed at the Great American Mock Trial Invitational in Washington, D.C. for the first time. We enjoyed the competitive field and had a successful showing. Zenzele Price won an Outstanding Attorney award for her performance as a prosecution attorney and Heather Pincus won an Outstanding Attorney award for her performance as a defense attorney. Full results here. Wesleyan Mock Trial came in second place at the Hooter Invitational in Washington, D.C., finishing with a 6-2-0 record. Nell Buechler won an Outstanding Attorney award for her performance as a prosecution attorney, and an Outstanding Witness award for her performance as a defense witness. Tess Vartanian won an Outstanding Attorney award for her performance as a defense attorney. Will Dempsey won an Outstanding Witness award for his performance as a prosecution witness. Full results here. Wesleyan Mock Trial sent a team of all new members (except for one prosecution attorney!) to compete at the Guardian Invitational, hosted by the Coast Guard Academy in New London, Connecticut. Wesleyan finished in first place with an undefeated 8-0-0 record. Zenzele Price won an Outstanding Attorney award for her performance as a prosecution attorney, Ethan Addis won an Outstanding Attorney award for his performance as a defense attorney, Virginia Sciolino won an Outstanding Attorney award for her performance as a defense attorney. Fitzroy (Pablo) Wickham won an Outstanding Witness award for his performance as a defense witness, Nika Litt won an Outstanding Witness award for his performance as a prosecution witness, and Aditi Mahesh won an Outstanding Witness award for her performance as a defense witness. On the bye-bust team, Tess Vartanian won an Outstanding Attorney award for her performance as a prosecution attorney and Joshua Ng won an Outstanding Attorney award for his performance as a prosecution attorney. Full results here.